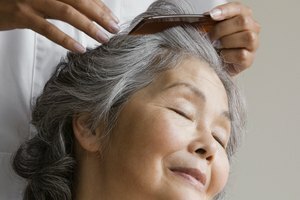 Graying hair is a natural part of the aging process. These pesky little hairs can start popping up as early as your twenties. Blending your problem grays with highlights, lowlights or all over color is an easy and subtle way to keep your youthful appearance. Create your plan of attack. You've spotted the grays or lived with them for years and you know you're ready to take action. 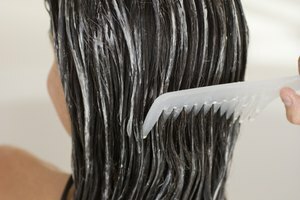 What you do next depends on your regular hair care regimen. Decide whether you're going to do an at-home color kit or consult your stylist for her opinion on the best way to cover up your gray. You can usually easily manage your first signs of gray with a few highlights. A few blonde highlights are great for blending in some wayward grays. The lighter color adds dimension to your natural hair color. The gray hair falls into the new color palate and becomes part of the multi-tonal new "do." Use lowlights for hair that is more gray than not. This is an easy way to infuse your natural hair color into the gray. These lowlights, colors designed to blend with your natural color more than stick out or cover it up, boost your natural color evenly throughout your style. Your last option is to start back at square one with all-over color. 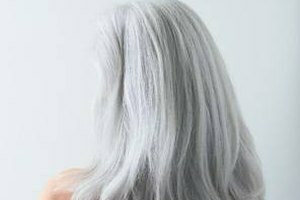 Take the plunge into all-over color if you have more gray hair than you would like to admit, have tried highlights or low lights and want more coverage, or if you already color your hair with some frequency. Maintenance is part of the game. 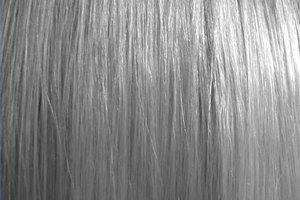 Unfortunately there is no permanent solution to deal with your grays. Continue to add high or lowlights every 6 weeks to keep up appearances and all over color every 4 weeks or as needed to cover your roots.